After slipping to a 0-1 home league defeat by 6th placed Nettleham Ladies the previous Sunday, The New Saints Ladies bounced back in style as they won 3-1 away to Bedworth United Ladies in their FA Women’s National League Division 1 Midlands clash at The Oval, Bedworth on Sunday. Saints’ defeat by Nettleham plus results elsewhere had left them in 9th place out of 11 in the table, 2 points behind 8th placed Burton Albion ladies in the table. Meanwhile, Bedworth went into the game on the back of a 3-6 away defeat by Leafield Athletic in a Birmingham Senior Cup tie in their most recent game on 16th December, which had taken their winless run in all competitions to 4 games to leave them in 4th place, level on points with 3rd placed Birmingham and West Midlands Ladies but with an inferior goal difference. Saints got off to the best possible start when Lia Lewis’ aerial ball straight from Emily Ridge’s tapped kick off found Laura Morris on the right who flicked it round Misty Mackinde before sending a through ball to Ridge. Amid confusion between Bedworth keeper Freeleigh Parnell and defenders Leanne Jones and Alice Belcher, Ridge managed to steer her right foot shot through Parnell’s legs and into the centre of the net with just 11 seconds on the watch. The game then became a little cagey with Bedworth coming back into it and the hosts went close in the 13th minute when Jodie McGuckin’s corner from the left was only just clawed away past her left hand post by Saints keeper Caitlyn Smith. Bedworth went close in the 14th minute when a ball found McGuckin in the left side of the box who turned Lauren Brown before laying it back to Sarah Rowles on the left front edge of the box. She took a touch before playing a short reverse pass to her left to McGuckin who took a touch and turned Brown before running towards the byeline and having her cross saved by Smith. The hosts went close again just into the 16th minute when McGuckin’s low through ball on the right found Evelina Buidaviciute who ran on before crossing from just inside the right corner of the box to the far post where Rowles fired her right foot shot from 3 yards wide of Smith’s right hand post. Saints went close 2 minutes later when Morris picked up a loose ball 28 yards out in a central position before squaring to her right to the on-running Lewis, whose low right foot shot from a couple of yards outside the right hand corner of the D was held by Parnell. Then a few seconds into the 25th minute, a long clearance upfield from Smith found Laura Pennington who ran on and into the box before being tackled by Mackinde. It looked to be a good tackle but to the hosts’ disbelief and amazement, Tamworth referee Niki Arrowsmith said penalty. When the fuss had died down, Pennington herself stepped up to fire the resulting spot kick into a rooted Parnell’s left hand corner to make it 2-0 (goal time 25). Bedworth went close in the 36th minute when McGuckin’s corner from the left to the far post found Amanda Whalley whose header from 6 yards was well cleared at her left hand post by Phoebe Davies. What proved to be the last chance of the half came Bedworth’s way right at the end of the 39th minute when a long ball from middle to left found Kirsty Farnsworth who ran on and into the box before having her left foot angled drive held at the second attempt by Smith. Saints actually finished the first half with only 9 players on the pitch due to injuries to both Pennington and right back Lauren Brown. Both sides made a change at half time with Jessica Lundie coming on for Leanne Jones for Bedworth and Saints bringing on Lauren James for the injured Brown. The first serious clear-cut chance of the second half came Bedworth’s way in the 60th minute when Farnsworth ran through on the left and into the box before having her left foot shot saved to her left by Smith. Then just before the end of the 62nd minute, the hosts pulled a goal back when Jones’ long ball over the top on the left found Farnsworth who ran on and into the box before toe-poking her low left from just inside the left hand corner of the 6 yard box into Smith’s left hand corner for her 6th league goal of the season to bring the Warwickshire side back into it. Bedworth made their second change in the 66th minute when Lydia Hackney came on to replace Buidaviciute. Another chance came the hosts’ way in the 67th minute when Hackney’s long free kick from just to the right of the centre circle on the halfway line was miscontrolled by Erin Taylor just outside the right hand corner of the D with the ball running to Rowles, whose left foot shot from 25 yards bounced on the edge of the 6 yard box before being saved to her left by Smith for a corner. Bedworth went close again in the 69th minute when Hackney’s low through ball from the right edge of the centre circle 10 yards into the Saints half found Lundie, who took 2 touches and sidestepped Kim Bebbington before sending a low diagonal through ball from middle to left to the just about onside Rowles who ran into the box to leave herself with a one on one with Smith before having her low left foot shot from 15 yards blocked by Smith for a great save. Saints made their second change in the 75th minute when Katie Doster came on to replace Morris. Bedworth kept up the pressure and they went close again in the 76th minute when Farnsworth ran into the left of the box before having her shot saved by Smith with the ball rebounding to Farnsworth, whose follow-up shot was blocked by Smith for a great double save. Saints went close in the 79th minute when Pennington’s corner from the left found Sarah Jackson who sidestepped a defender inside the box before firing her left foot shot just over the bar to Parnell’s left. Both sides made their final change in the 82nd minute with Katy Huntbach coming on for James for Saints before Sophie Wilson came on for Milly Miller for Bedworth. It was 3-1 in the 84th minute when Davies won a tackle in the centre circle in the Bedworth half before sending a low through ball to Ridge on the left, who beat Alice Belcher before crossing low for Doster who got in ahead of Mackinde to fire her right foot shot with the outside of her foot from 4 yards into Parnell’s right hand corner. Then after just under 5 and three quarter minutes of added time at the end, a long ball over the top from the middle of the centre circle found Ridge inside the box, Parnell came out and in her attempt to punch the ball away from Ridge’s header followed through and caught the striker’s head. Referee Arrowsmith said penalty as both players went down although it was Parnell who came off worst and after lengthy treatment, she was unable to continue so Hackney took over in goal. After a total stoppage of 2 minutes 24 seconds, Jackson stepped up to take the spot kick which was saved to her right by makeshift keeper Hackney. That was the final action as 15 seconds later, the final blast of referee Arrowsmith’s whistle brought the game to a close and confirmed Saints’ win. It was a battling performance by Lawrence Wilson’s side who showed great character under pressure at times as they bounced back from the previous week’s defeat by Nettleham. Bedworth: Freeleigh Parnell, Leanne Jones, Evelina Buidaviciute, Amanda Whalley, Milly Miller, Leona McCook, Sarah Rowles, Jodie McGuckin, Misty Mackinde, Kirsty Farnsworth, Alice Belcher. Subs: Sophie Wilson (for Miller 82), Lydia Hackney (for Buidaviciuite 66), Jessica Lundie (for McCook 46). Saints: Caitlyn Smith, Lauren Brown, Phoebe Davies, Lia Lewis, Laura Morris, Jodie Bragan, Kim Bebbington, Sarah Jackson, Emily Ridge, Laura Pennington, Erin Taylor. Subs: Katy Huntbach (for James 82), Katie Doster (for Morris 75), Lauren James (for Brown 46). 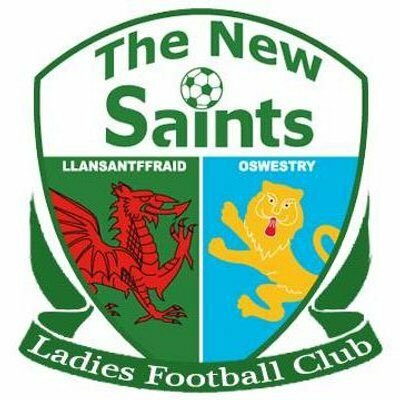 The New Saints Ladies have no league fixture this coming Sunday (27th January) with their next scheduled league game being on Sunday 3rd February away to West Bromwich Albion Women. That match is due to be played at Boldmere St Michaels FC’s ground, Church Road, Boldmere, Sutton Coldfield with a 2.00pm kick-off.